Officials in Miami are hoping police officers will be able to steer opioid addicts into to treatment rather than jail. A plan announced Monday will offer addicts an opportunity to go into rehabilitation. 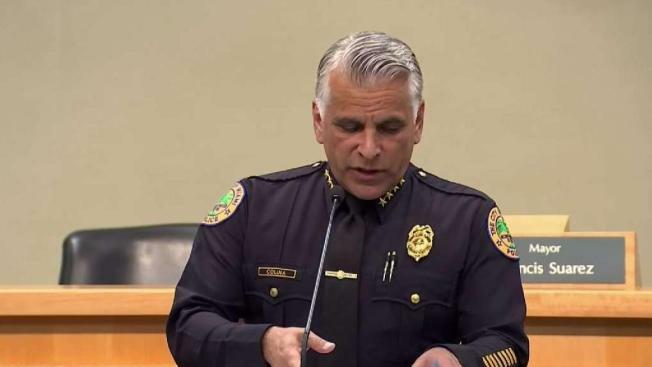 The Miami Herald reports Miami police will use $1.6 million in federal grants to develop a pre-arrest diversion program where people with small amounts of opioids can enter a one-year outpatient treatment program. They are working with Jackson Behavioral Health Hospital, the South Florida Behavioral Health Network, the University of Miami Health system and other agencies to develop the program. The plan includes anti-addiction medication, social services, mental health counseling and general medical care. Dr. Patricia Ares-Romero of the Behavioral Health Hospital says the program could treat about 100 people over the three-year life of the grant. "This will serve as a potentially life-saving resource for those who need it most," City of Miami Mayor Francis Suarez wrote in a tweet announcing the program. The U.S. Centers for Disease Control and Prevention estimated that drug overdoses killed a record 72,300 Americans in 2017, about 10 percent more than in 2016. The majority of the deaths involved opioids. But a growing number of them are from illicit synthetic drugs, including fentanyl, rather than prescription opioids such as OxyContin or Vicodin. A Florida Department of Law Enforcement report found opioids were identified as either the cause of death or were present in the decedent's system in 3,037 cases between January and June in 2017, a 20 percent increase from the same time period in 2016. The figures for the second half of 2017 are still being compiled.